Did you know than an office fitout, if not undertaken responsibly, can and does have detrimental effects on the environment? It’s not hard to see why – consider how many offices there are around Australia. Fortunately, there are a number of ways that a fitout can be used to make your workplace more environmentally friendly. If your office requires partitioning, consider the possibility of it being reusable and multifunctional. A demountable system, for example, can allow for 100% reuse in future workplace reconfigurations and even relocations. This means you aren’t using up precious resources and landfill, as well as saving you money. It is important that you opt for Australian made furniture wherever possible. Purchasing from local sources makes sense from a community perspective, as well as ensuring that you have faster and easier access to the furniture. You will also be using less energy, as the pieces won’t need to be imported from overseas. 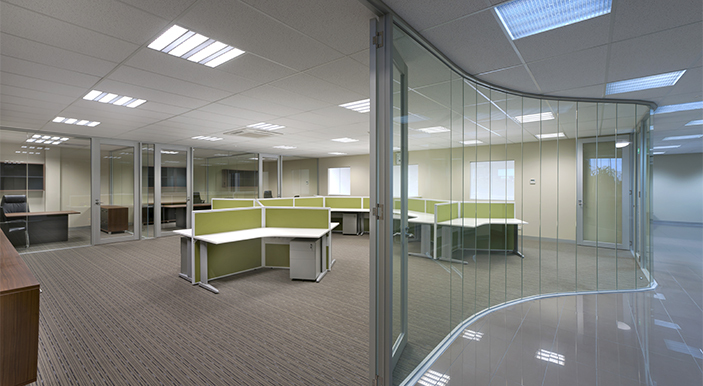 Energy efficient LED lighting solutions are essential for any office fitout. Sensor switches (which automatically turn lights on and off) are a good option for infrequently used rooms. The workplace should, however, be designed to have as much access to natural light as possible. An open plan design is often quite effective for achieving this. It is important that the business owner and/or managers take an active role in planning the fitout. They should understand the environmental impact that their decisions have, as well as being made aware of more eco friendly alternatives. Perhaps if they are involved in every step of the decision process, things will change. Most air conditioning systems are designed for minimal fitouts only and utilise the smallest unit possible, running flat out. It is actually much more economical to have a larger inverter air conditioner installed – it will also last longer and require less maintenance. Open plan offices also offer the advantage of needing less cooling less often than a conventional space with partitioned spaces. As you can see, there are a number of steps that you can take during your upcoming office fitout to improve the environmental friendliness of your workplace. To help ensure that the earth is around for years to come, it is important that you utilise as many of these process as possible. The team at Topaz Furnitureis happy to guide you through.